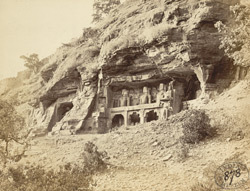 Photograph of rock-cut figures of Jain tirthankaras in Gwalior, from the Archaeological Survey of India Collections: India Office Series (volume 33), taken by George Edward Herne in 1869. Large sculptures of Jain 'tirthankharas' or saviours, dating between the 7th and the 15th centuries, are cut into the rocks along the steep sides of the road leading up to the Urwahi Gate of Gwalior Fort on the western side of the plateau. This view shows part of a group of 22 standing tirthankaras of up to nineteen metres in height set into deeply carved recesses. This range of sculptures dates from between 1400 to 1453.